U.N. humanitarian chief Stephen O'Brien described the cholera outbreak in Yemen, which is fast approaching 300,000 cases, as a "man-made catastrophe" caused by the warring sides in the country's civil war and their international backers. "This is because of conflict, it's man-made, it's very severe, the numbers are absolutely staggering, it's getting worse, and the cholera element in addition to the lack of food, the lack of medical supplies, primarily one has to put that at the door of all the parties to the conflict," O'Brien said. "Be that the parties on the ground or their proxies, they all have to recognise that there is a shared responsibility for causing a man-made humanitarian catastrophe, which is where we are in Yemen at the moment." A Reuters analysis of WHO data showed the cholera case load is growing at more than 4 percent a day, while the number of deaths is rising at just over 3.5 percent a day. That means the disease is spreading twice as quickly as the WHO feared. The WHO's representative in Yemen said on May 19 that the 300,000-mark might come within six months. 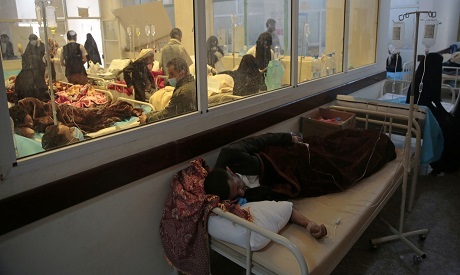 Yemen's cholera epidemic follows an economic collapse and two years of civil war which has left 19 million people in need of humanitarian aid. Nigel Timmins, humanitarian director at aid charity Oxfam, which has called for a "cholera ceasefire", told a U.N. meeting on Wednesday that governments were stoking the war rather than prioritising the humanitarian crisis. "In Yemen, governments who are providing generous funding are also making money from supplying weapons, munitions, military equipment, technology. They are providing logistical and financial support for the military action taking place," he said. "Diplomatic pressure on the warring parties inside and outside the country has to be made so that we can find solutions, because surely that is a priority over arms sales?"